The song was ranked the number one on Rolling Stone's Reader's Choice: Singles of the Decade list in 2009 and number 65 on the 100 Best Songs of the Decade list in the same year. It has sold over 2 million copies in the United States as of 2010. The single peaked at #2 on the Billboard Hot 100, making it Green Day's most successful song in the United States. The song was the ninth-highest-selling single of the 2000–2009 decade with worldwide sales exceeding 5 million copies. "Boulevard of Broken Dreams" won the Grammy Award for Record of the Year. Armstrong wrote the song about his time in New York City, about "feeling alone" and trying to take power from that fact. Armstrong felt the song fit nicely with the album's storyline, which is about "going away and getting the hell out, while at the same time fighting their own inner demons." The song's title is from a James Dean poster in which he is walking through New York with an overcoat on. Green Day's "Boulevard of Broken Dreams" from American Idiot. "Boulevard of Broken Dreams" was named Record of the Year at the Grammy Awards of 2006. The song's broad appeal was demonstrated by its performance on several Billboard singles charts: it spent 14 weeks at number one on the Mainstream Rock Tracks chart staying there for 38 weeks, 16 weeks at number one on the Modern Rock Tracks chart staying for 32 weeks, 11 weeks at number one on the Adult Top 40 chart staying at 44 weeks, and 4 weeks at number one on the Mainstream Top 40 staying there for 26 weeks. This was the first song to top the 4 charts altogether making this song a multi-chart success. It reached number two on the Billboard Hot 100, staying there for five weeks behind 50 Cent's "Candy Shop". This was also the first Green Day song to reach the Adult Contemporary chart, peaking at number 30 and though "Good Riddance (Time of Your Life)" didn't chart on the Adult Contemporary, it did chart on its recurrent chart. The award-winning music video for "Boulevard of Broken Dreams" was directed by Samuel Bayer. The music videos for "Holiday" and "Boulevard of Broken Dreams" were filmed with a single, continuous storyline—the video for "Boulevard of Broken Dreams" picks up where "Holiday" has left off, with the last few seconds of "Holiday" audible at the start of the "Boulevard of Broken Dreams" video. The video depicts the band members after their car has stalled in the desert, and they begin a melancholy walk down a dusty road. Scenes are interspersed with film footage, taken from around Los Angeles, of homeless people and other miserable sights. The video also features performance footage of the band playing the song in an abandoned warehouse. The video features a 1968 green Mercury Monterey convertible that was modified for filming in the "Holiday" and "Boulevard of Broken Dreams" videos. The car features a hood ornament in the shape of the hand and heart grenade image from the American Idiot album cover, which was also used in the video for "Holiday". But the "iron fist" was actually used in the video for "Walking Contradiction", when the band members meet at a car towards the end of the video. The band's name is also on the front of the hood in silver letters. The band rode this car to the 2005 MTV Video Music Awards ceremony. As shown in an MTV Making the Video special, Bayer used unorthodox techniques to achieve the aged look of the "Boulevard of Broken Dreams" video, including using rear projection (as opposed to green screen) and physical damaging the negative: scratching the film with razor blades, pouring coffee on it, and smudging cigarettes on it. A Gottfried Helnwein painting titled "Boulevard of Broken Dreams" features James Dean, Marilyn Monroe, and other celebrities, and is a spoof of the famous Edward Hopper painting Nighthawks. In the 2005 VH1 Storytellers program featuring Green Day, Billie Joe Armstrong stated that the title of the song was "nicked" from Helnwein's painting; however, Armstrong was apparently referring to a different Helnwein painting featuring James Dean. ↑ Grein, Paul (January 20, 2010). "Chart Watch: Week Ending Jan. 17, 2010: 21 Million Lady Gaga Fans Can't Be Wrong". Yahoo! Music. Archived from the original on January 24, 2010. Retrieved July 15, 2010. ↑ "Biggest Selling Singles Since The Year 2000". Yahoo. Archived from the original on October 11, 2012. Retrieved 2013-04-28. 1 2 Winwood 2010, p. 50. 1 2 "International Superhits". Kerrang!. London: Bauer Media Group (1061): 52–53. June 18, 2005. ISSN 0262-6624. ↑ DiPerna 2005, p. 29. ↑ DiPerna 2005, p. 28. ↑ Goodman, Elizabeth (December 20, 2006). "Noel Gallagher Turns Loathing of Green Day Into Personal Pastime". Rolling Stone. Archived from the original on May 17, 2009. Retrieved April 16, 2008. ↑ Helnwein, Gottfried. "Gottfried Helnwein | NEWS | News Update | Helnwein's Boulevard of Broken Dreams". www.helnwein.com. Retrieved 2015-09-21. ↑ "'Boulevard Of Broken Dreams' by Green Day". Songfacts. Retrieved 2015-09-21. ↑ "Australian-charts.com – Green Day – Boulevard of Broken Dreams". ARIA Top 50 Singles. ↑ "Austriancharts.at – Green Day – Boulevard of Broken Dreams" (in German). Ö3 Austria Top 40. ↑ "Ultratop.be – Green Day – Boulevard of Broken Dreams" (in Dutch). Ultratop 50. ↑ "Ultratop.be – Green Day – Boulevard of Broken Dreams" (in French). Ultratop 50. ↑ "Danishcharts.com – Green Day – Boulevard of Broken Dreams". Tracklisten. ↑ "Green Day: Boulevard of Broken Dreams" (in Finnish). Musiikkituottajat – IFPI Finland. ↑ "Lescharts.com – Green Day – Boulevard of Broken Dreams" (in French). Les classement single. ↑ "Musicline.de – Green Day Single-Chartverfolgung" (in German). Media Control Charts. PhonoNet GmbH. 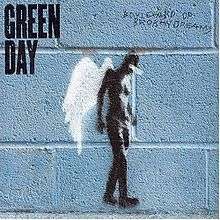 1 2 "Green Day - Boulevard Of Broken Dreams". acharts.com. Retrieved July 15, 2010. ↑ "Nederlandse Top 40 – Green Day search results" (in Dutch) Dutch Top 40. ↑ "Charts.org.nz – Green Day – Boulevard of Broken Dreams". Top 40 Singles. ↑ "Norwegiancharts.com – Green Day – Boulevard of Broken Dreams". VG-lista. ↑ "Swedishcharts.com – Green Day – Boulevard of Broken Dreams". Singles Top 100. ↑ "Swisscharts.com – Green Day – Boulevard of Broken Dreams". Swiss Singles Chart. ↑ "Green Day – Chart history" Billboard Hot 100 for Green Day. ↑ "Green Day – Chart history" Billboard Mainstream Rock Songs for Green Day. ↑ "Green Day – Chart history" Billboard Alternative Songs for Green Day. ↑ "Green Day – Chart history" Billboard Adult Contemporary for Green Day. ↑ "Green Day – Chart history" Billboard Adult Pop Songs for Green Day. ↑ "Green Day – Chart history" Billboard Pop Songs for Green Day. ↑ "UK Year-End Chart 2004" (pdf). The Official Charts Company. Retrieved July 27, 2011. ↑ "ARIA Charts – End Of Year Charts – Top 100 Singles 2005". Australian Recording Industry Association. Archived from the original on 2014-12-11. Retrieved 2011-04-04. ↑ "Austrian Year-end singles for 2005" (in German). Ö3 Austria Top 40. Retrieved 2010-08-25. ↑ "Year End European Hot 100 Singles Chart 2005 01 – 2005 52" (PDF). Billboard. Nielsen Business Media, Inc. Retrieved July 27, 2011. ↑ "Mahasz Rádiós TOP 100 2005" (in Hungarian). Association of Hungarian Record Companies. Retrieved 2011-04-30. ↑ "Årslista Singlar – År 2005" (in Swedish). Sverigetopplistan. Retrieved 2011-04-30. ↑ "Swiss Year-end singles chart for 2006". Swiss Music Charts. Retrieved 2010-08-30. ↑ "UK Year-End Chart 2005" (pdf). The Official Charts Company. Retrieved July 27, 2011. ↑ "Billboard – End Of Year Charts – Top 100 Singles 2005". Billboard. Retrieved 2011-04-04. ↑ "Canadian single certifications – Green Day – Boulevard of Broken Dreams". Music Canada. ↑ "Guld og platin november/december/januar" (in Danish). IFPI Denmark. Archived from the original on January 30, 2015. ↑ "Gold-/Platin-Datenbank (Green Day; 'Boulevard of Broken Dreams')" (in German). Bundesverband Musikindustrie.